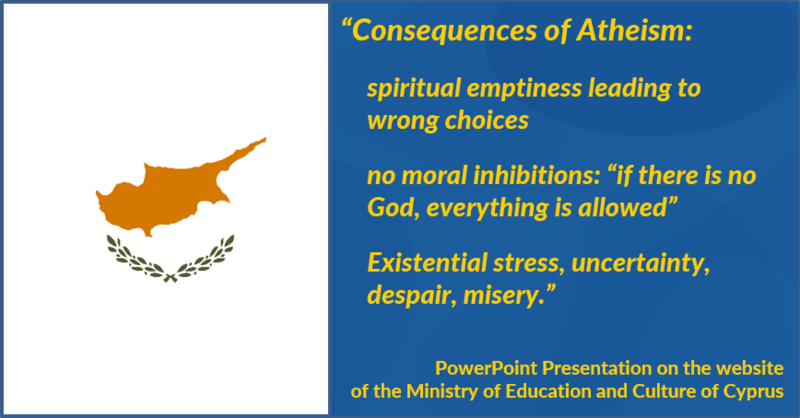 The Ministry of Education and Culture (MoEC) of Cyprus is preaching hate and blatant lies against atheism in an effort to keep school children away from non-religious points of view. According to a high-school textbook and teachers’ online material available at MoEC’s website, atheists are ‘immoral, selfish and sinful’. The material also encourages students to distance themselves from atheism and its ‘dreadful consequences’ and promotes a radical vision of Christian Orthodox faith. Let us avoid atheism then, to avoid experiencing its bad and sinful consequences. Unfortunately, the presentation’s content is also evident in high school textbooks. It is clear that the aforementioned polemic against atheism is nothing more than hate speech. Furthermore, it discriminates against atheist students and parents, misinforms about what atheism is and attempts to drive pupils away from it. The newly-founded Cyprus Humanist Association, already a proud member of EHF and IHEU is taking all legal measures to battle and prevent indoctrination, and tries to counter the heavy influence of the Church of Cyprus on the national educational system. It has already appealed to the Ombudsman and to the MoEC but the presentation is still on the ministry’s official website. It has appealed to the media and plans to take legal steps as well regarding hate preaching against atheism by the MoEC. The EHF is deeply concerned by the fact that such teaching material is promoted by the Education Ministry of a Member State of the European Union in a way that goes against fundamental values of the EU. The EHF therefore stands behind the Cyprus Humanist Association and will seek to support its action in addressing this major issue.